Didn’t see this one coming. AOR that actually sounds fresh despite having pedigree that goes back to the mid 80’s! As a genre AOR seems stuck within 2 camps. The old school sound where bands are trying to relive the genre’s glory days on diminished recording budgets and lesser song craft, and the new breed which never seem to quite hit the nail on the head despite all the OTT marketing a certain label likes to give its latest “new supergroup” act. Anyway, back to the music, Alien have reformed their classic debut album line-up and essentially turned the clock back. This is majestic and bombastic melodic rock with a strong smattering of pomp. In a way its not a million miles away from Magnum’s “On A Storytellers Night” album such is the magnificence of Tony Borg’s strong guitar hooks married to Jimmy Wandroph’s keyboard orchestration and the big vocal melodies of Jim Jidhed (whose voice has a touch of Bob Catley about it), yet there is also an injection of a American influence too, somewhere around where Bad English plied their trade. That said, despite these two reference points the sound is pretty original. The 12 tracks have a good flow to them, from the slowly building opener “In Love We Trust”, to the hook laden “Unbroken” and mid tempo “Love Will Lead Me Home” which has a great chorus to it. And so the album goes on in pretty much similar fashion throughout. “WIldheart” does see the sound rocked up an extra notch though. That said its not great all the way though. The go nowhere fluff of “I Believe” and album closer “In Truth” would not be lost if absent, as indeed would a couple of Jidhed’s “wooo oooo o ooooo o” vocal wailing’s on a number of song intros, but even with that taken on board this is still very good stuff. Overall a nice surprise from the Swedish rockers, if you like AOR then this is as essential as the genre gets in 2014, if you’ve been bored stiff by the genre the last few years this shows there is still some gems to be had. Very nice indeed. 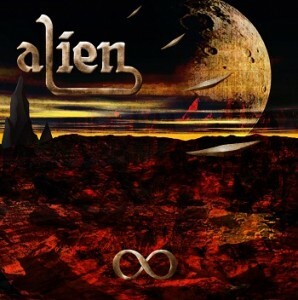 This entry was posted in Reviews and tagged alien, eternity, jim jidhed, review. Bookmark the permalink.